Giant LARP Throwing Beer Mug! Coreless item, Perfect for Throwing! Just for Throwing, Not Drinking! 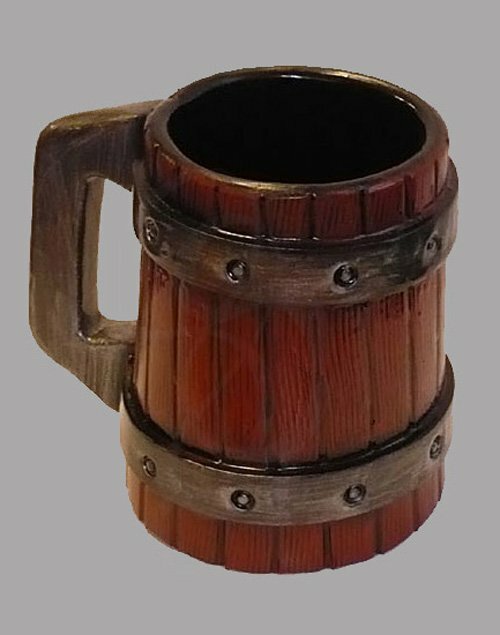 We don't know of anyone who doesn't need a LARP Throwing Beer Mug! This oversized tankard is completely made from foam and latex, it is a coreless item. There are many, many uses such as: Catch your LARP opponent off guard with a TKO via Tankard, perfect for barmaids tending the local tavern to keep customers in check and maybe even keep a couple around the office for those co-workers who get out of line (our boss has one ready to throw at all times!). Let your imagination flow and have fun with these unconventional Inchesdrinkwears Inches. While all safety measure are taken during manufacturing, such as choosing non-toxic material, it still is recommended not to be used for drinking purposes as the item still needs to be treated with Maintenance Silicone spray. Latex products do need to be maintained to a certain degree. We offer a Maintenance Silicone that can be purchased separately in the LARP Accessories section. We recommend you use the Silicone on a regular basis, it is a easy, spray on application. The silicone will keep the coating flexible and make the products last much longer. The maintenance silicone protects the coating from drying out, and helps the product resist wear and tear. This latex beer mug is not for drinking out of.